I have not tried this one. It appears to be a crumble cake, much like the Thanksgiving Blend. This one is a blend of virginia and cavendish tobaccos graced with the essence of plum brandy. They also say that they offer a cheaper shipping option now. I might have to pass on this one. The holiday crunch is on and any extra cash I have right now is going to the wife for Christmas shopping. 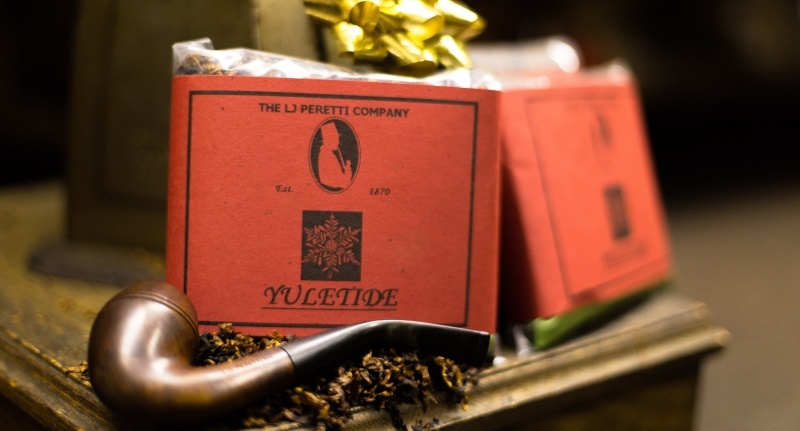 Has anyone tried their Yuletide Blend? when there's so many with cheaper rates. Ok, that is a bit high. I didn't check it out, but when they said cheaper shipping, I expected a significant reduction. I agree, shipping of $20 is way to high for 4oz of tobacco. I really don't understand that at all. I think they may have a deal with UPS that has to do with the size of the box and not so much the weight. I've made a few purchases from Peretti's in the last few months and found the cost to ship 4 oz. is about (within a buck or so) the same as the cost to ship 8 or 16 oz. I've placed 4, 8 and 16 oz. orders, the only constant has been the size of box each of my orders came in. My plan now is to wait until I can order 16 oz. before ordering. I forgot to mention I have not tried the Yuletide blend. I read on another forum that if you call them they will work out a cheaper shipping option for you, but for the moment UPS is all that is offered with online orders. Of course I found this out after their Thanksgiving Day blend and 15% off sale were done & gone. Actually, I just when through their entire online form all the way up to payment, and they do have much cheaper shipping options available now. For 4 ounces of tobacco shipped to CA, I show options for First Class Mail Parcel at $2.38, Priority at $7.15, and UPS ground for 13.48. That is great news for Peretti's fans. I'm pretty happy, now I can try their other blends without feeling "had" when I complete my order, which means they will get more of my business. I did get my last order under the 15% off sale. Nice. BTW D&B, if you haven't tried Thanksgiving Day and would like to I can hook you up. Just PM. Fantastic! Maybe I'll be able to try the Yuletide after all. They do have some nice tobacco choices. They have a bit of "attitude " on the phone but that's how I would suggest would be the BEST way to order from them! It's how I've ordered from them for years and NEVER had any problems. Spoken like a true devotee of the hellish weed, Jack! I'm right proud of ya'. Unsure why they charge less to go farther. There was NO other option when I went on there today and I did go completely through to check out. Maybe there a bit prejudiced with Texans or Southerners. Okay, never mind, I went back on and yes it's lower and more shipping options. Just my luck I'd go on there just before they updated there site. Back in July when I ordered my last 8 oz paint can of RB I recall paying $10.50 or so for Parcel Post delivery to Texas. Don't be in such a hurry and you pay less !! The drop in shipping prices to USPS Priority gave me incentive to order the 8 oz. paint can of Park Square I've been wanting to pick up. That stuff is absolutely de-frickin-licous and should age just beautifully. It also gave me the opportunity to pick up some Dundee to try. Plus, what the heck, I'm a sucker for Christmas blends so I couldn't resist the Yuletide. I don't hesitate to try any of the Peretti blends, since I've never had a bad one and have discovered some new favorites. I ordered 4 oz of yuldite and 2 oz of other blends yesterday and my shipping charge was $3.28. I would certainly call that fair. Cheers all! 'Coarse Ron lives back in the piney woods of E. Texas and all delivery services have to use mules to get back there thru the trees to deliver packages so they charge MORE ! !